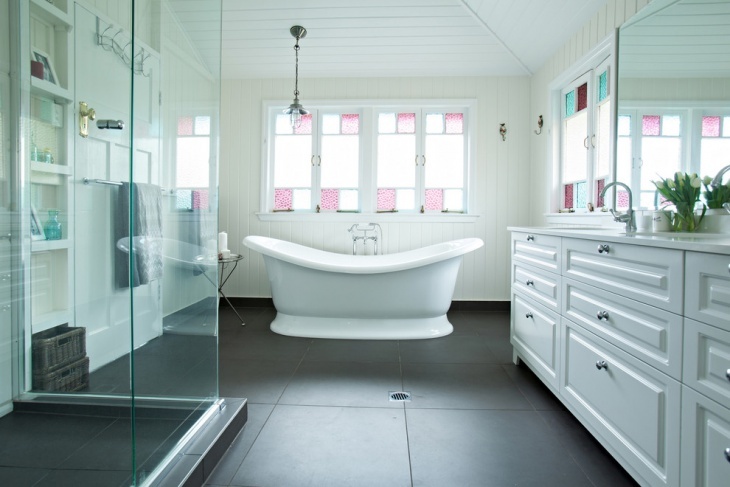 Concrete has long been used for bathroom flooring. It has other utilities as well, apart from being durable. The changing living habits have resulted in the incorporation of new elements in the concrete floors. 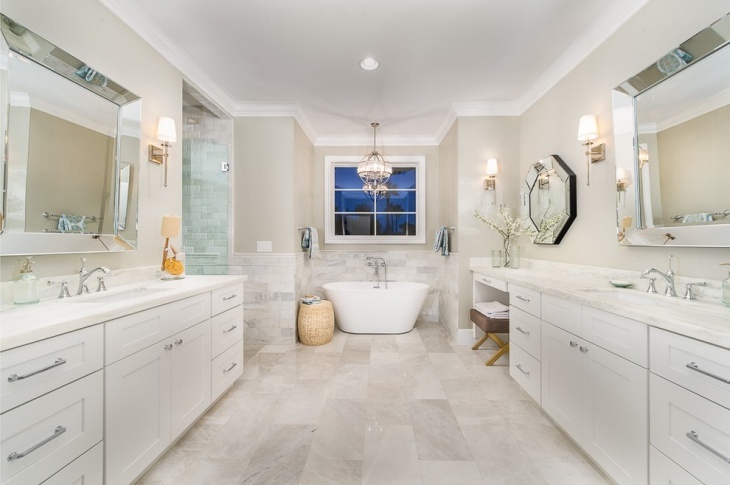 When you look out for a customised concrete bathroom floor, you can opt for polished bathroom floor ideas, stained bathroom floor ideas and so on. There are many Bamboo Flooring design themes, and here are ten beautiful bathroom flooring ideas that will live up to your taste. 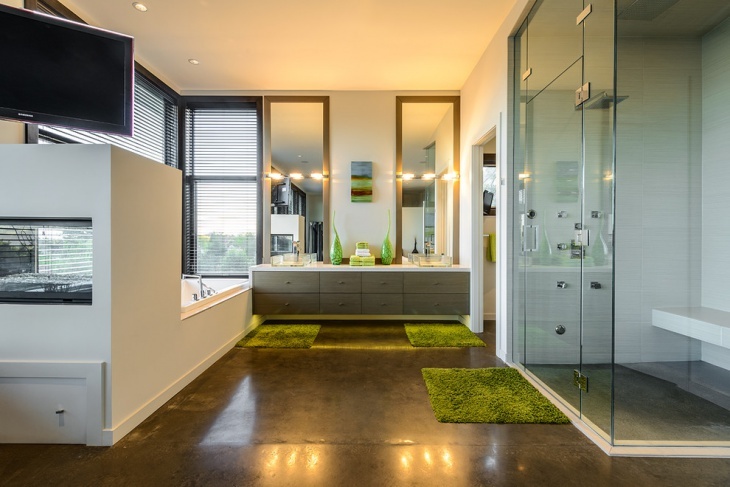 Contemporary bathrooms with vanity mirrors and glass shower screens need a fitting floor. You can opt for a concrete floor with a bronze colored tints. The colored floor goes well with white walls in the bathroom. 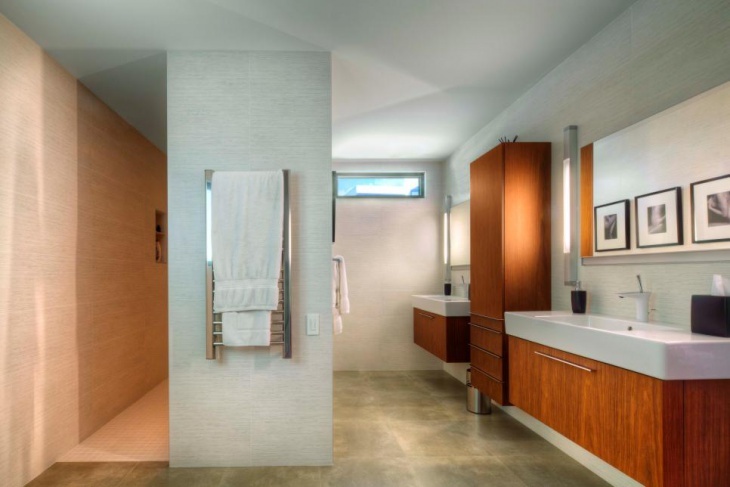 Matching lights yield a bronze hue in the bathroom and they make the look complete. 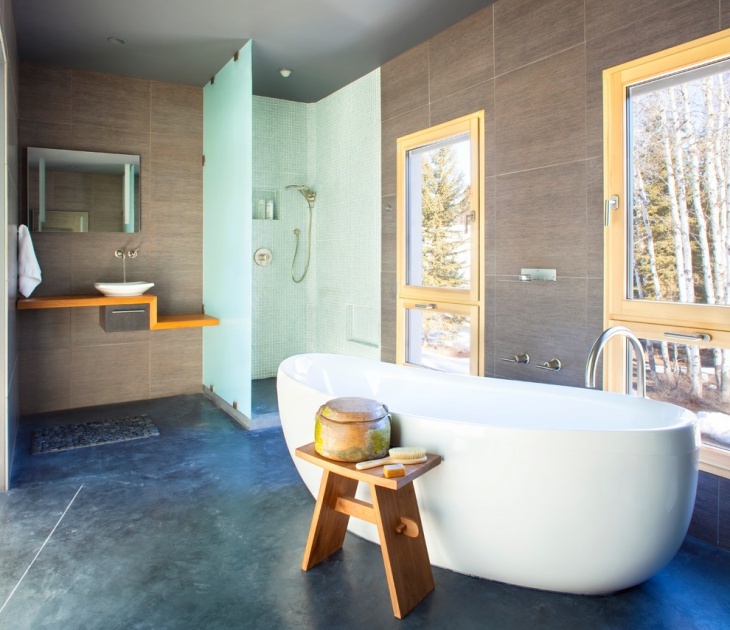 Simple bathrooms look good with stained concrete floors. You can choose a particular color for the floor which goes well with the interior. You can install a white bathtub in the room, and it complements the elegant shower screen here. 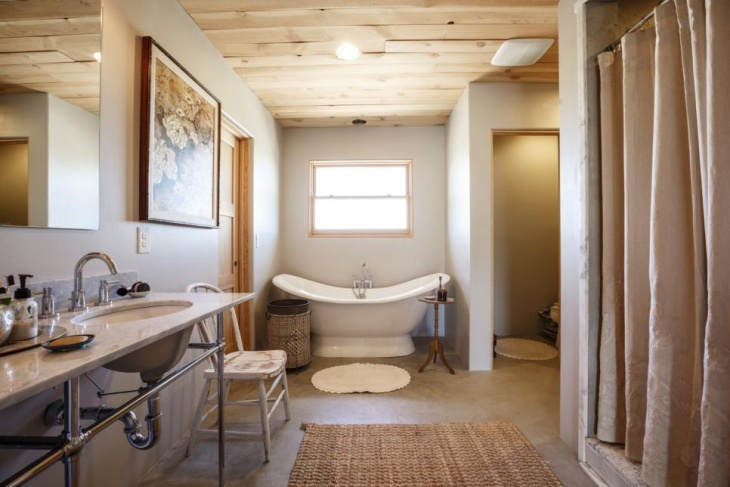 In narrow bathrooms with tan walls, the stamped concrete bathroom floors look nice. It has a brown-orange color and goes well with the concrete sink and white walls. A chalkboard backsplash is ideal for this bathroom. The wall mounted faucet looks matching with this setting. 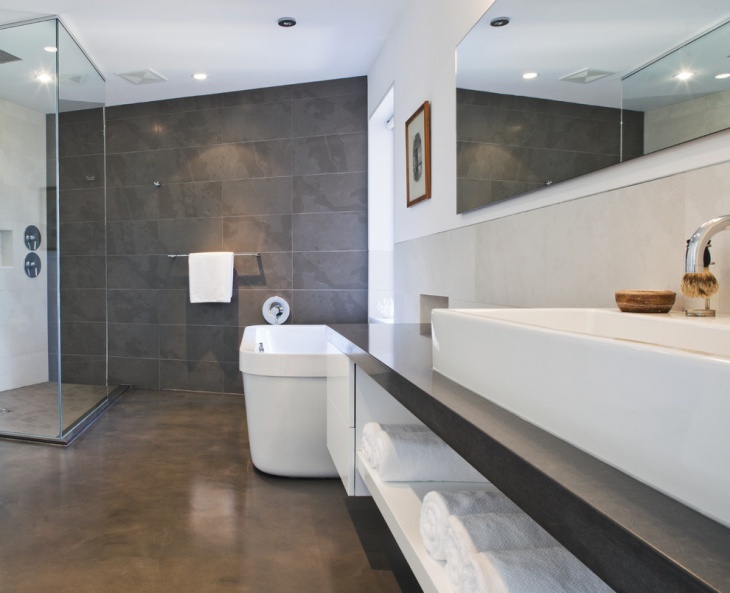 In modern bathrooms, a simple polished floor can generate the intrinsic beauty of concrete. With wooden baseboards, it enjoys a great compatibility. Grey shower tiles and wood vanity tops create a contrasting beauty in the bathroom. The latest trend of bathroom designing has been the incorporation of floating cabinets. 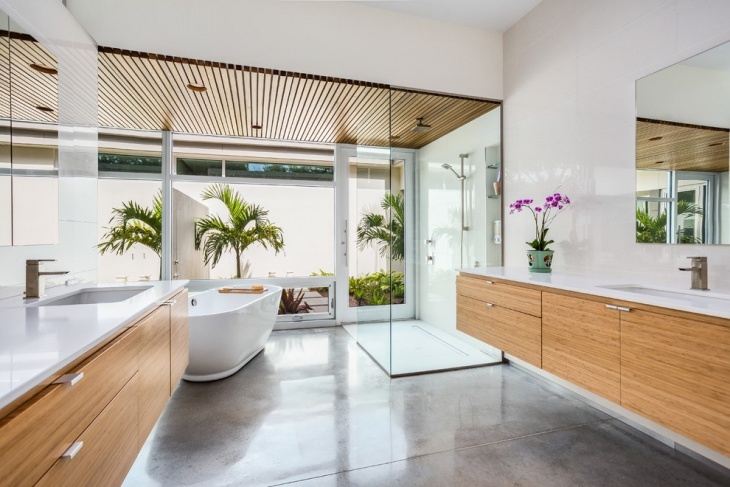 In these spacious bathrooms, a natural colour of the floor can retain the sleek looks. Incorporate a polished concrete floor in the room to get a gorgeous interior. It enjoys great compatibility with the low wooden cabinets. 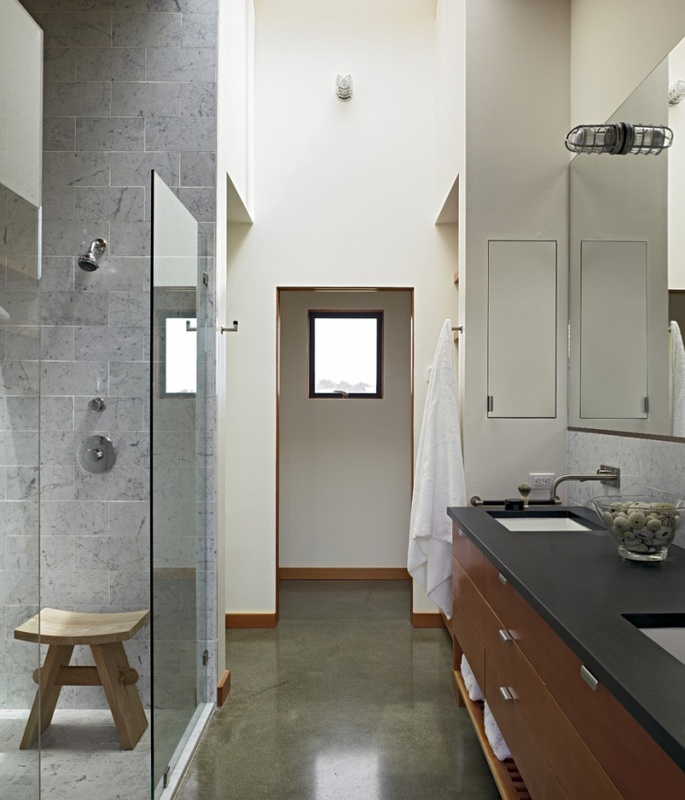 A blue-grey stained concrete floor is ideal for a master bathroom of contemporary homes. It goes well with brown bathroom walls made of tiles. You can buy ceramic bathroom accessories and tubs to get a contrasting setting. The blue shower screen and light brown door-frames make the bathroom look elegant. 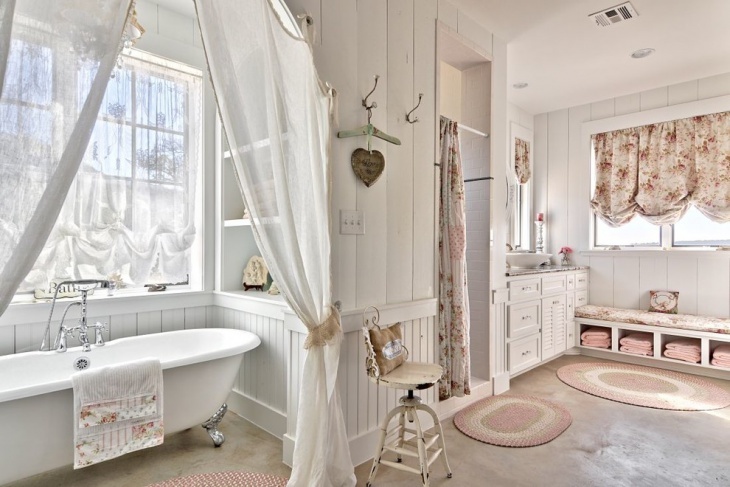 This is the perfect bathroom theme for you when you have ceramic tile walk in showers and wooden cabinets. 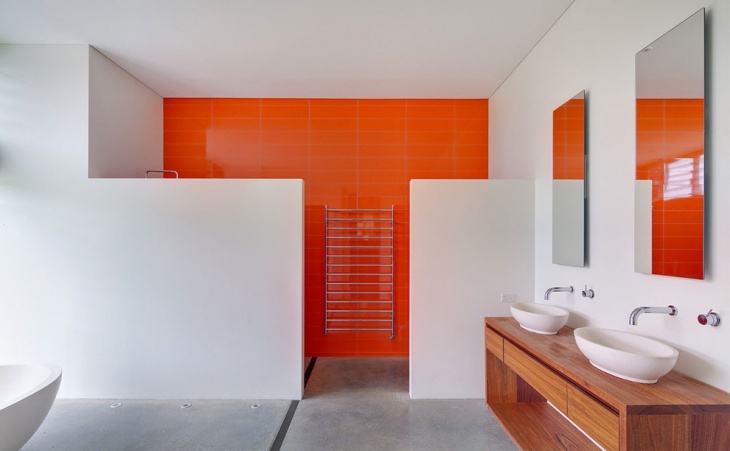 The orange walls are ideal for the open shower and a grey concrete floor looks matching with this setting. Paint the walls white to retain the brightness of the interior. 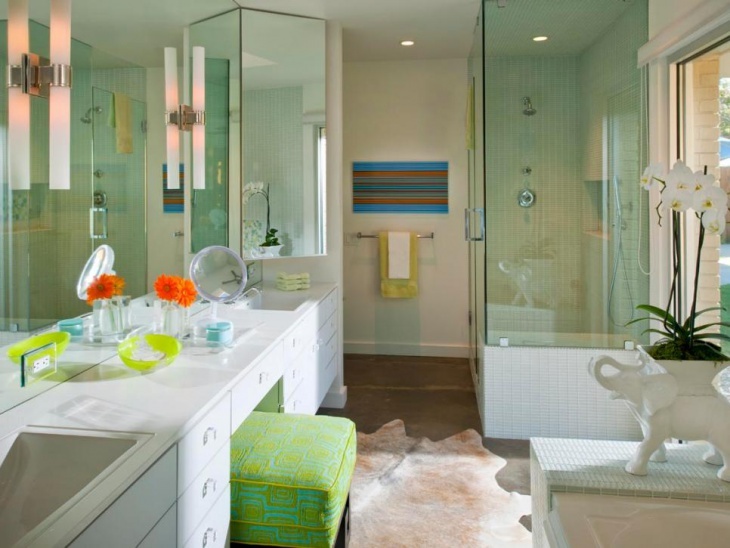 There are people who love to create a difference in the Interior Floor Design of the bathroom. 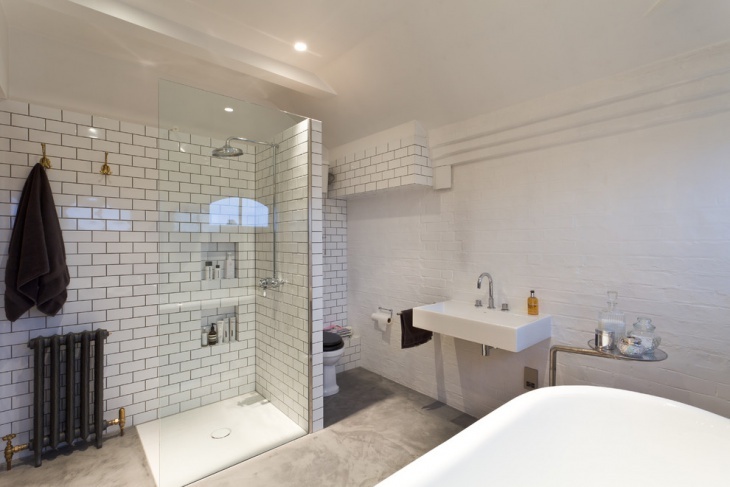 In this setting, the bathroom has shower cubicles and you can incorporate the brick-styled design on the walls to complement the grey-white flooring idea. 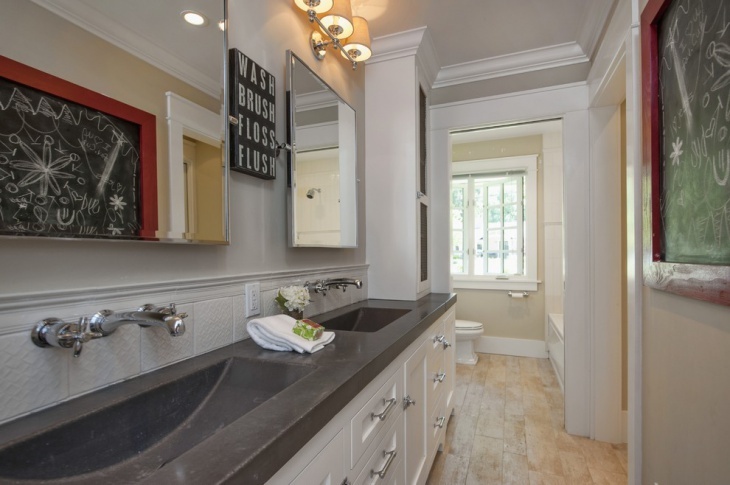 A grey floored bathroom has a great compatibility with black and white interior design in the bathroom. The concrete bathtub is ideal for this setting. 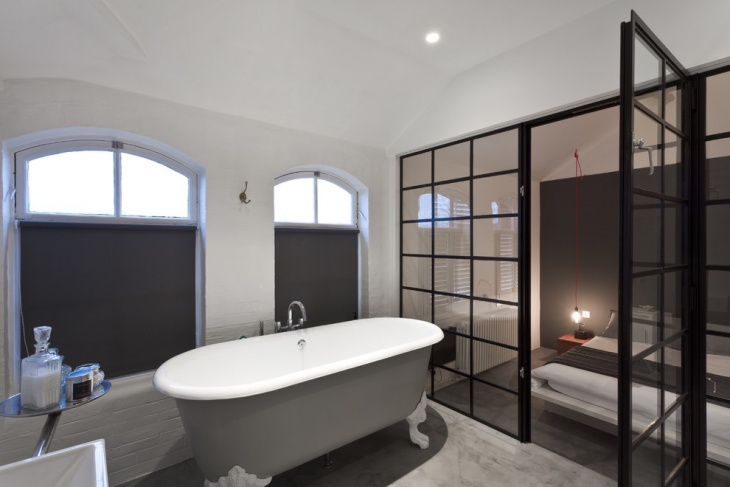 There are arched windows in the bathroom and the floor goes well with the white walls and black metal entrance. 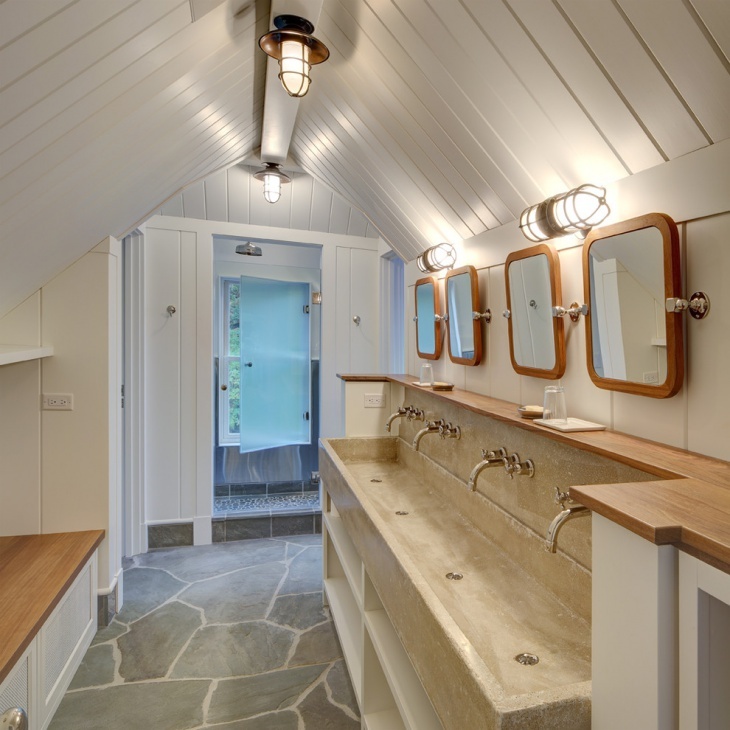 Fix small pendant lights in the ceiling to get a complete beauty in the bathroom. When you look out for new trends of the concrete bathroom floor, you will definitely come across a diverse array of ideas. For instance, you can incorporate the Black & White Floor idea or the Bathroom Laminate Flooring idea in your bathroom. 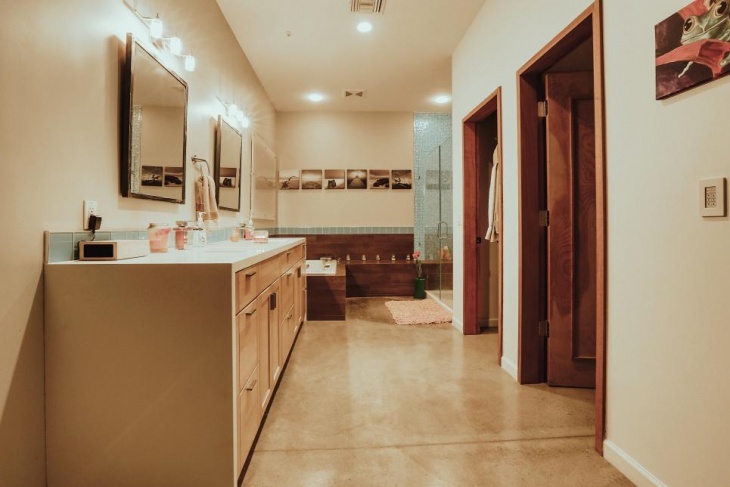 Well, you too can come up with innovative concrete bathroom flooring ideas, and when you do so, you can share them with us.